Meta: Zebra Danios are adorable fish with the zebra-patterned body. Let’s take a look at these techniques to treat them properly in the aquarium. Zebra Danios (scientific name: Danio Rerio) are freshwater fish originally found in around wider range strained from Pakistan and Myanmar. Their main characteristic can simply be seen from their zebra’s color pattern. Like any other fish, Zebra Danios (a.k.a Zebra fish) need to be treated properly in order to grow well. 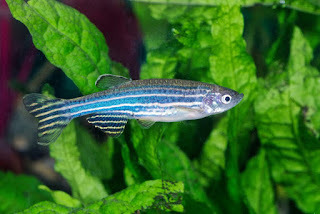 Check out these maintenance techniques of zebra danio fish in the aquarium. The first thing you need to pay attention to keep Zebra Danio fish in the aquarium is preparing a proper tank. Danios grow better in groups. Hence they need to live in a quite large aquarium. It’s recommended to put five or six danios in a tank that accommodates minimum 25 gallons (95 liters). Putting three Danios in the narrower tank is tolerable, but they will be prone to stress, and it can lead to aggressive behavior. To decorate the tank, you can add grit and plants. They will not only prettify your aquarium but also give Danios some places to hide and swim actively. Caring for Zebra Danio fish in the aquarium is quite easy. Zebra Danios are schooling fish, meaning that they live in a group. In open water, a school of zebra danio like swimming together in a large group. It’s recommended to keep Danios away from aggressive fish, but you can add some other fish to the aquarium, such as barbs, corydoras catfish, similar-sized gouramis, loaches, and swordtails. As Danos are easy to care, you can feed them in a small amount. They are not picky eaters, but avoid overfeeding them because it will cause problems for your Danios. Feed them only two to three times in a week. Description: dwarf gourami fish disease ranges from fungal infection to new tank shock syndrome. Here are some of the most common ones. Gourami is a hardy fish family, but dwarf gourami may develop certain types of disease in the tanks. Dwarf gourami fish disease types range from common freshwater fish ailments to a specific virus. Knowing about these common diseases will help you in detecting and treating them. Here are the most common diseases you could find in dwarf gourami fish. 1.Fin RotFin rot is caused by fungal or bacterial infection, resulting in jagged fins. Other symptoms include decreasing appetite and whitish color. The fish will die if left untreated. The infection signs start from the fin tips. If the infection reaches the fin base, the fish cannot regenerate and must be discarded. Meta Description: Clown fish is well-known for its beauty and vibrant color. These are some important tips to maintain your clown fish in a saltwater aquarium. Clown fish has become one of the most popular saltwater aquarium fish. Besides their appearance as a main protagonist in the “Finding Nemo”, they also have vibrant orange color that makes them really beautiful. Naturally, many fish lovers want to keep them as a member of their community tank. If you’re still new to the game, here are some tips to maintain your clown fish in a saltwater aquarium. 1)Prepare enough size of aquarium Clown fish can grow up to 15 cm in length, so you should prepare at least 90 cm x 30 cm x 38 cm aquarium. It will be really troublesome if your aquarium isn’t big enough for the clown fish and you have to move them into a bigger aquarium. Meta Description: Some decorations are essential to bring out the real beauty of your aquarium. These are some lovely decorations in saltwater aquarium that you can choose. Saltwater aquarium without any decorations is like a plant without any flowers. It’s still beauty, but there’s something missing. Decorations in saltwater aquarium aren’t just for the aesthetic looks, but also for your fish’s well-being. By using decorations in your aquarium, fish will have places to hiding and playing. These are some decorations in saltwater aquarium that you might love. 1)Rocks Don’t underestimate the power of rocks because with a right placement, you can turn your aquarium into a fancy looking marine world. For saltwater aquarium, natural or artificial rocks like sandstones, metamorphic or plastic rock will be a great choice.